How about the halloween this year? Yes we celebrated it by watching 3 horror films, smirnoff ice and cola. 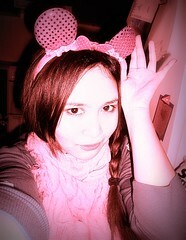 My hubby had a clown mask again and me had a Minnie Mouse hairband that I bought in Manila last 2 months ago. Anyway I don’t have so much to say now. I’m too tired and besides it’s already 2:20am!!! Time to hit the sack! 😉 natta!